Messier 108 occupies an area of 8.7 by 2.2 arc minutes of apparent sky, corresponding to a spatial diameter of 110,000 light years. The galaxy is inclined 75 degrees to our line of sight. 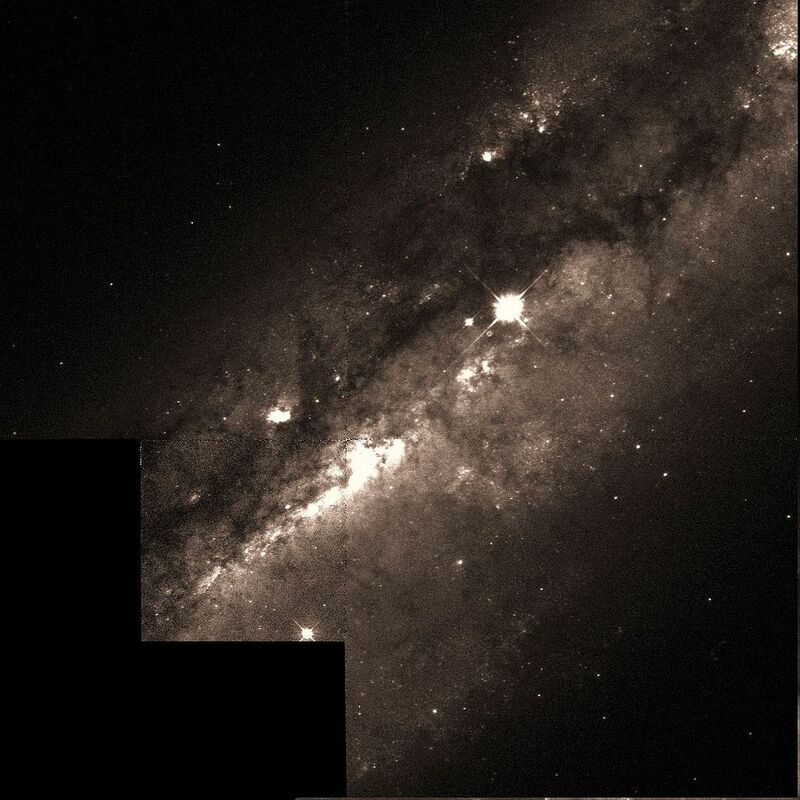 Even though it appears almost edge-on, M108 is a popular target among amateur astronomers and astrophotographers because details of its structure can be seen even in amateur telescopes. 3-inch telescopes will only reveal an elongated streak of light with a brighter core, while 8-inch instruments will hint at the galaxy’s dusty regions and bright and faint patches. The galaxy is easy to find as it lies only 1.5 degrees southeast of the magnitude 2.37 star Merak, Beta Ursae Majoris, one of the Pointer Stars in the Big Dipper. M108 appears in the same wide field of view with the Owl Nebula (M97), which is located only 48 arc minutes southeast of the galaxy. 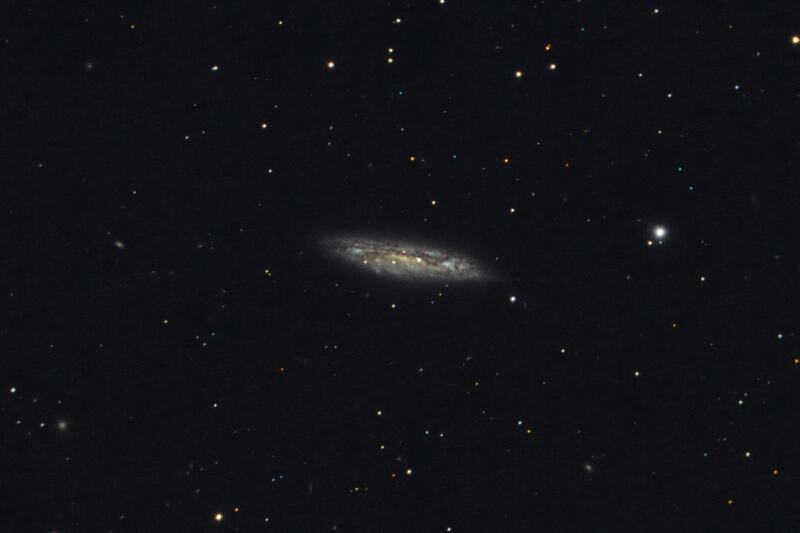 The best time of year to observe M108 is during the spring. The galaxy is circumpolar north of latitude 35N and can be seen throughout the year. Messier 108 has the morphological classification SBbc, which means that it is a barred spiral galaxy with somewhat loosely wound spiral arms. The galaxy does not have a pronounced core or bulge, but appears very mottled and dusty, with few H II regions and clusters of young stars. The dust structures are prominent in the galaxy’s disk and very thick in front of its bulge. The central region of M108 is bright and irregular, with a large central bar. The estimated mass of M108 is about 125 billion solar masses. The galaxy contains about 400 billion stars and an estimated population of 290 globular clusters. 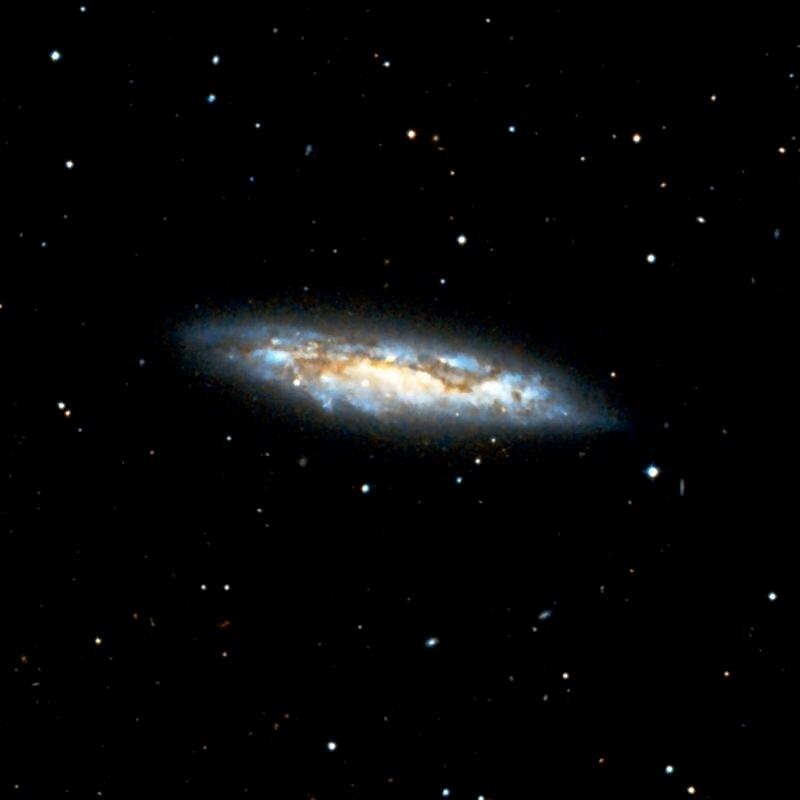 M108 is receding from us at 699 km/s. Messier 108 also contains H1 supershells, shells of expanding gas driven either by bursts of star formation and the resulting supernova explosions, or by infall of gas from outside the galaxy, or possibly by radio jets. The H1 supershells in M108 extend for several kiloparsecs. Messier 108 contains 83 X-ray sources, discovered by the Chandra X-ray Observatory. 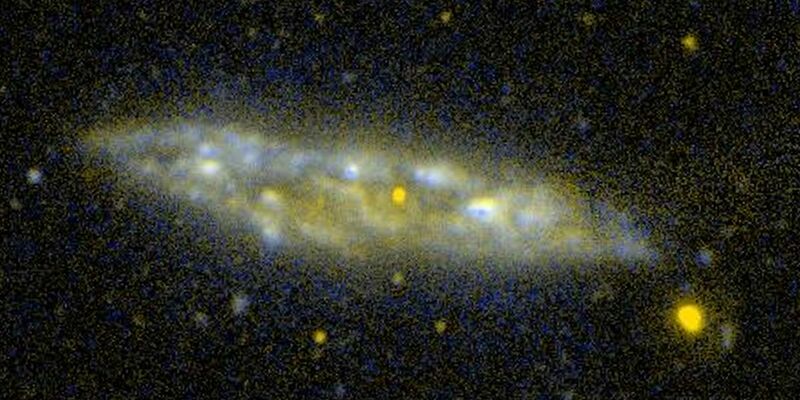 One of these sources was found at the nucleus and its spectrum indicates an active galactic nucleus (AGN). However, observations with the Spitzer Space Telescope have not confirmed this. The brightest X-ray source in M108 is suspected to be an intermediate-mass black hole that is accreting matter. Diffuse soft X-ray radiation was discovered within 10 kiloparsecs of the optical galaxy. The supermassive black hole at the galaxy’s core has an estimated mass of 24 million solar masses, or six to eight times the mass of the supermassive black hole at the centre of the Milky Way. Messier 108 is one of the brightest, largest members of the Ursa Major Cluster, a cluster of galaxies located in the Virgo Supercluster. 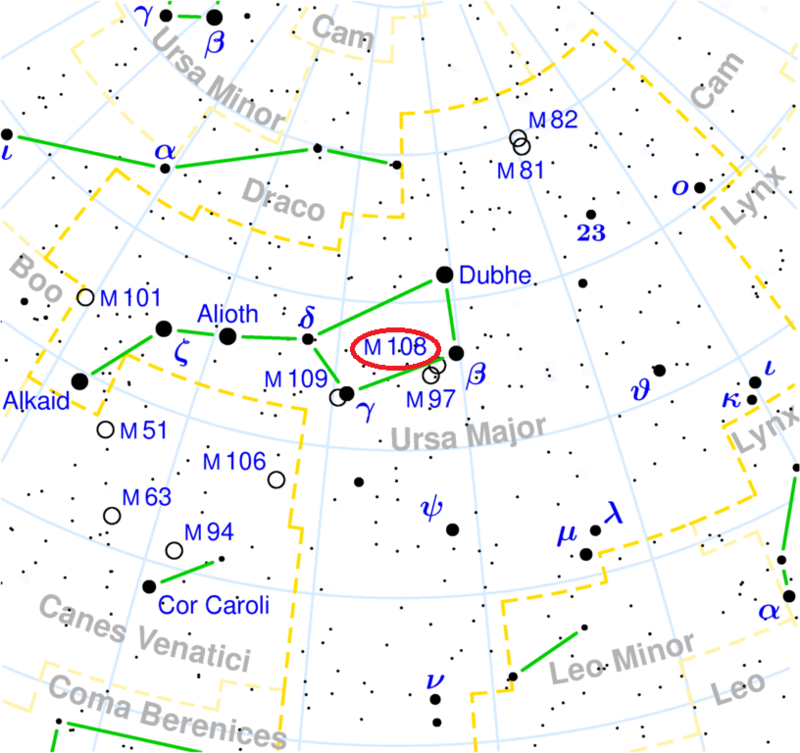 M108 is an isolated member of the group. A supernova, designated as SN 1969B, was observed in M108 at magnitude 13.9 on January 23, 1969. It was classified as a Type II supernova. Nebula near the preceding… it is even fainter: it is 48 or 49′ further north and 30 min… following in RA: Found by M. Méchain 2 or 3 days after the preceding [Messier 97]. Very bright. Much extended [elongated]. Resolvable [mottled, not resolved]. 10′ long, 2′ broad. There is an unconnected pretty bright star in the middle. A large milky-white nebula, on the body of the Great Bear, with a small star at its sp [south preceding, SW] apex, and an 8th-magnitude preceding [W] it at double the distance; there is also a brightish group in the np [north preceding, NW] quadrant. It is easily found, since it lies only about 1 deg south-east of Beta, Merak. This object was discovered by H. [William Herschel] in April, 1789; and is No. 831 of his son’s Catalogue. It is faint but well defined, being much elongated with an axis-major trending sp [south preceding, SW] and nf [north following, NE] across the parallel, and a small star, like a nucleus, in its center. As H. [WH] considers this star to be unconnected with the nebula, it follows that it is between us and it, and therefore strengthens to confirmation our belief in the inconceivable remoteness of those mysterious bodies. An irregular, patchy spiral 8’x1.5′ in p.a. 84deg; quite bright. Has a faint nucleus and shows a number of condensations, three of which are almost stellar; a star of magn. 11 near the nucleus. See Abs. Eff. 4 s.n.